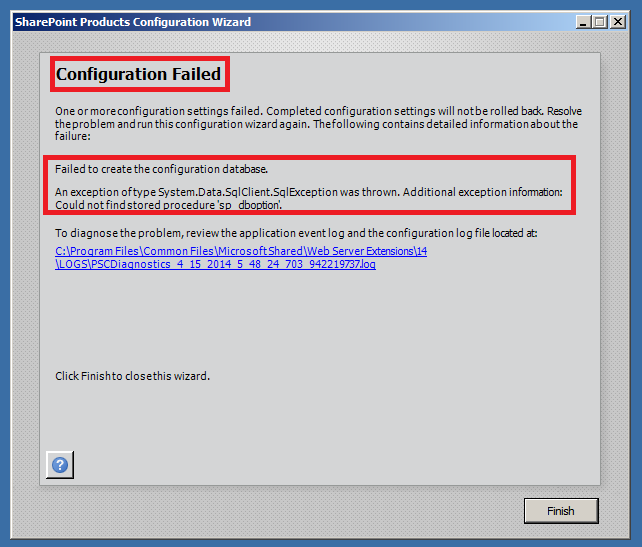 Failed to create the configuration database. An exception of type System.Data.SqlClient.SqlException was thrown. Additional exception information: Could not find stored procedure ‘sp_dboption’. After a bit of reading I found that SharePoint Server 2010 needs SP1 to be installed before I could configure it with SQL Server 2012. I reached to the Microsoft Knowledge Base article : http://support.microsoft.com/kb/2460045 , downloaded the SharePoint Server 2010 SP1 and executed it. The setup of SP1 took 5-7 minutes and then after the SP1 setup, I restarted my computer. once again I executed “SharePoint 2010 Products Configuration Wizard” at this time it worked like magic.